CANDY STRIPE CYCLONE SOCKS ... Fun Candy Stripe Over the Calf Socks are very Soft and Stretchy! These popular Red Lion Brand Spiral Cyclone Striped Knee High Socks feature a Candy Stripe Swirl Pattern around the top of the sock, have Sewn-in Heel construction, as well as Cushioned Sole & Foot which provides Extra Comfort and Durability. Care Instructions: Due to the sewing weave method of these Candy Stripe Socks - Hand Washing or Wash Separately on Delicate Cycle, and Tumble Dry Low is highly recommended. 25 Candy Stripe Sock Colors: (as shown above - Left to Right, Top to Bottom) � White w/ Black Stripes, � White w/ Gold & Royal Blue Stripes, � White w/ Gold Stripes, � White w/ Gold & Black Stripes, � White w/ Red Stripes, � White w/ Red & Black Stripes, � White w/ Royal Blue Stripes, � White w/ Royal Blue & Black Stripes, � White w/ Orange Stripes, � White w/ Orange & Black Stripes, � White w/ Light Blue & Black Stripes, � White w/ Light Blue Stripes, � White w/ Pink & Hot Pink Stripes, � White w/ Pink & Black Stripes, � White w/ Pink & Lime Green Stripes, � White w/ Lime Green & Black Stripes, � Black w/ Hot Pink & Lime Green Stripes, � White w/ Turquoise Blue Stripes, � White w/ Maroon & Black Stripes, � White w/ Vegas Gold & Black Stripes. More Colors available but not shown below: � White w/ Navy Blue Stripes, � White w/ Purple Stripes, � White w/ Kelly Green Stripes, � White w/ Dark Green Stripes, � White w/ Maroon Stripes. 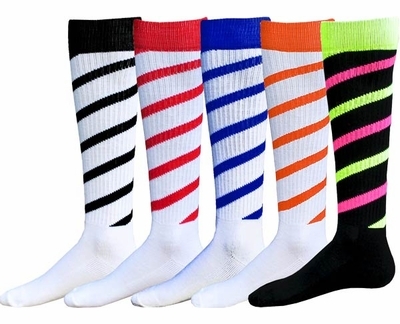 These FUN Cyclone Candy Stripe Swirl Socks can be worn while playing many Sports: Volleyball, Soccer, Basketball, Softball, Cheer, Dance, Lacrosse, Baseball, Football, Running, etc... so make sure to buy enough for the whole team. NOTE: We've done our best to show the true color of these Cyclone Socks, however since all monitor resolutions and brightness settings are different, these bright colors may look different on your computer screen. PLEASE call us if you have any questions about color-matching to uniforms, etc. Thank You. As team mom for my daughters 8u softball team, I wanted to order some fun socks for the girls. I came across these fun candy stripe socks so I ordered them very late one night. The only shipping option I had was standard so i picked that but immediately emailed the company, since it was the middle of the night and I knew they wouldn't be open, telling them i was worried I wouldn't receive my order in time and could I possibly pay to have a faster shipping method. By morning I had a reply email from them letting me know that my item had already shipped and that I should receive it in just a few short days. I was shocked when they arrived just 3 short days later. Amazingly fast shipping and the socks are great quality too. Highly recommend this product and this company. These socks are perfect for our softball team. Colors are perfect. Q-sport luckily called me to be sure order was correct thank goodness b/c I ordered 2 different sizes for the team and one size I ordered the wrong color. Shipping was super fast, thanks Q-sport. Purchased for girls softball team, design is not your normal pattern and sock is very durable. Our softball girls loved the socks! They were shipped so quickly too! The girls loved their new softball socks. Compliments all day from other teams and parents on how good these socks looked with the uniforms. Great looking & Great Quality! I bought these for my daughter's softball team. They paired them with black pants and a lime green shirt. I have to say this combo made for the sharpest looking uniform on the fields this year. Love them! Ordered these socks for a girls 14U team and they are really soft! Girls say they are very comfortable. My softball girls loved these cyclone socks. They were perfect. I ordered these socks for my daughters softball team and they are great! Love the socks!! The socks makes our co-ed team stick out with style and fashion!! They were quick to delivery. The computer messed up so I called them and they were very understanding and pleasant!! ProsThe colors matches our team colors. ProsThe fit was good and the colors wild.